A couple years back, I wanted to read Pet Sematary. These days, I prefer epubs to printed books. But believe it or not, the only epub edition I could find of that book, without torrenting a bootleg copy riddled with scanning errors, was in German. So, I had to go to a bookstore, something I hadn’t done in a long time. I found a mass-market paperback copy on the horror shelf of a Barnes & Noble near the World Trade Center. I could have been in and out of the store like a flash, but failure to browse in a bookstore is an intellectual misdemeanor, so I took a look around. When I think of a bookstore, the genres on the shelves tend to hold steady. Fiction and literature, horror, mystery, nonfiction, supernatural teen romance...huh? That shelf caught me by surprise. I knew Twilight was a big thing, but until I walked into that bookstore, I had no idea that supernatural teen romance was a standalone genre, much less that it could command thirty feet of shelf space. That’s pretty damned impressive, but also makes soon-to-be middle-aged male me gag just a little bit. What does this have to do with today’s horror flick, Stake Land? Well, Stake Land is a vampire movie, and these days, one could expect that would mean it’s a squishy romance. One would be wrong. Stake Land is a post-apocalyptic tale. The earth has been infested and taken over by vampires. But these vampires aren’t the suave, sophisticated, lady killer type we’ve all grown to know and love. These vampires are pure monster. They no longer have human intelligence, instead reverting to animalistic instincts in a never ending hunt for human flesh. A small group of survivors must navigate the wasteland in search of mythic New Eden, a land of safety and plenty. Wait a minute. Am I sure this isn’t a zombie flick? The case for this being a zombie film: the monsters eat human flesh; the monsters are stupid, no longer retaining the abilities of speech or reason; the monsters can be killed by severing the brainstem; a bite will spread the infection; the infection caused the collapse of civilization. The case for this being a vampire film: the monsters hunt like animals, not zombies; the monsters can also be killed with a stake to the heart or exposure to sunlight; the monsters have fangs. Fangs, huh? I’m sold. It’s a vampire flick. Martin (Connor Paolo) is a young man with a problem. A vampire just killed his entire family, and he’s next. Luckily for him, the enigmatic Mister (Nick Damici) arrives on the scene. He rescues Martin, and the two set off trying to find safety. Along the way, Mister imparts his vampire-killing knowledge to Connor, and the two rack up some kills. The goal for the two of them is to head north, away from the apocalyptic religious cults that have sprung up in the American south. Those fanatics believe that the zombie plague is the end time that heralds the coming of the lord. The vampires have been sent to cleanse the earth of sinners. Whether true or not is beside the point. There’s no arguing with a fanatic during the collapse of human civilization. All that will do is get a person fed to a hungry pack of vampires in a sacrificial offering. The two pick up a couple other cast members here and there. There’s Sister (Kelly McGillis), a nun who ran afoul of the fanatics; Belle (Danielle Harris), a young woman desperate to find safety for herself and her unborn child; and Willie (Sean Nelson), a Marine also trying to evade the fanatics. In this film, the fanatics, led by the evil Jebedia Loven (Michael Cerveris), are every bit as dangerous as the monsters. The erstwhile survivors have more problems with them than they do with the bloodsucking man-eaters. Stake Land was an ultra low-budget production. Director Jim Mickle had about five bucks to work with. Consequently, he kept things simple. There are lots of rural locations and abandoned industrial buildings. Not much has to be done to dress up those areas to make them look like the end of the world has come. Dark lighting and good makeup serve as creature effects in the film, and they are done well. The best thing to be said about the movie is that it looks and feels very professional. There isn’t a bit of cheapness about the production. It’s a simple story that moves from set piece to set piece. In some spots where the narrative cohesion is fraying a bit, Mickle uses voiceover as a fix, but it’s a forgivable sin. 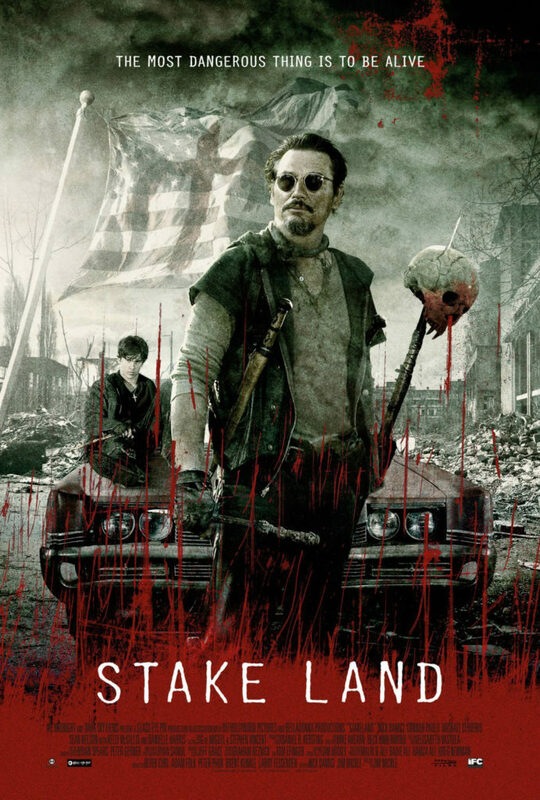 Stake Land is a scary little horror film. Well made and well acted. It didn’t knock my socks off with its originality, but I was glad I saw it.